In Part 1 of my New Orleans Travelogue, I stuck with the "Old Guard" - traditional places, like Galatoire's, Felix's Oyster Bar, and Mr. B's Bistro, serving mostly traditional dishes. For a long time, it seemed like this was all you could find in New Orleans. New or old, it was as if every place was required by the Napoleonic Code to offer gumbo, shrimp remoulade, étouffée, and blackened redfish. You could tell the more contemporary places because they would affix a sprig of thyme or rosemary like a flag post in the middle of the plate. That kind of culinary solipsism is sometimes one of the trade-offs of a city with such a passionate food culture. We saw much the same thing on our visits to Spain: the food is mostly outstanding - if you like Spanish food. But nobody talks about the Italian restaurants in Spain. Still, during our more recent visits to New Orleans - post-Katrina - things seems to be changing. The city not only has more restaurants than it did before the hurricane and floods (nearly 500 more, according to Tom Fitzmorris' count at The New Orleans Menu), it seems to be more open to a greater variety of restaurants. To start exploring what's new, I met up with good friend, talented chef, and Louisiana native Chad Galiano (a/k/a Chadzilla), who returned home this past year after an extended sojourn in South Florida. We had an ambitious plan to hit three spots in the Central Business District for lunch in one day, though sadly ran out of steam after only two (I suspect New Orleans' liberal open container policy - are "go cups" also in the Napoloenic Code? - had something to do with it). 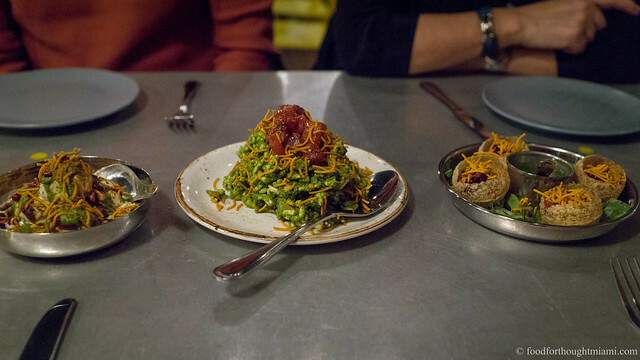 Pêche is a new addition to the small stable of restaurants opened by chef Donald Link. 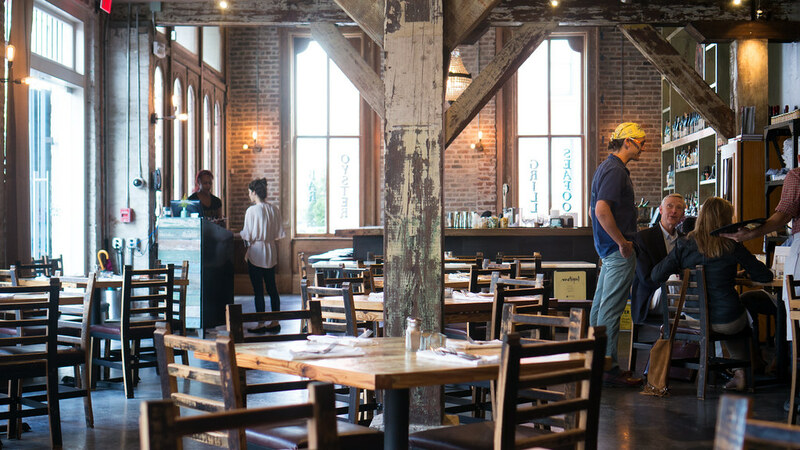 After first making a name for himself at Herbsaint, Link returned to his Cajun roots with Cochon, which opened only a couple months after Katrina (and which was one of the best meals of my last visit to New Orleans). Cochon Butcher, a butcher shop and sandwich shop around the corner, followed soon after. 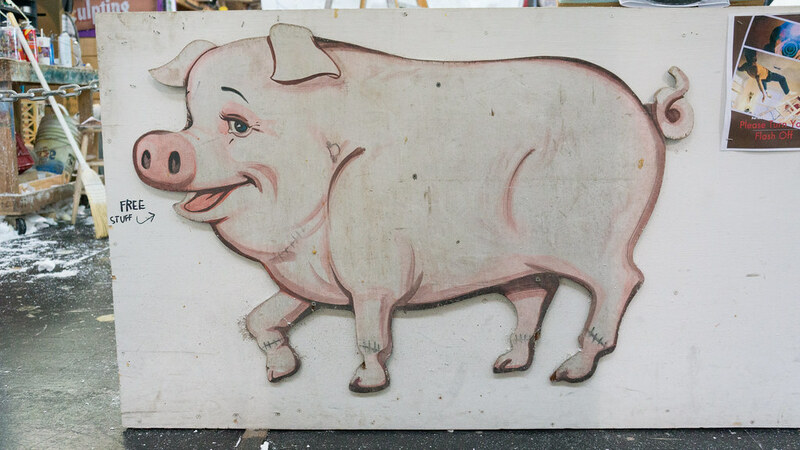 As their names suggest, Cochon is largely dedicated to the pig in all its glorious forms, while Pêche revolves around seafood. So where better to start than with a big seafood platter? (You can see all my pictures in this Peche flickr set). 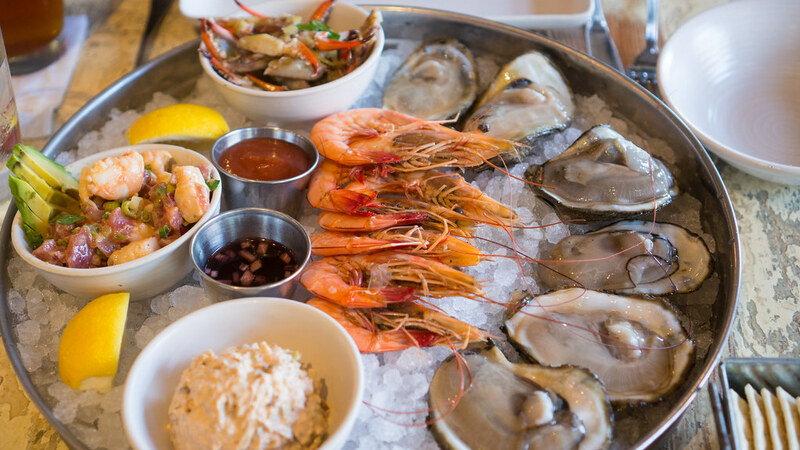 Pêche's seafood platter was mostly a compilation of items that can also be ordered a la carte from the raw bar section of the menu. Oysters come from three different sources along the Gulf (on our server's recommendation, I punctuated them with a dash of the house-made habañero and sweet potato hot sauce on the table). Fresh head-on Gulf shrimp are steamed and chilled in their shells, retaining all their sweetness. A mound of smoked tuna salad has the smooth texture of deli tuna, but with a delicate perfume of wood smoke. Tiny crab claws swim in a soft vinaigrette brightened with chili and mint. A seafood salad combines cubes of raw tuna, tender cooked shrimp and fresh avocado. I fear I will live out the rest of my years vainly trying to recreate the glory of the massive, over-the-top seafood platter we had at Au Pied de Cochon this summer; but on a more modest scale this resonated in all the same ways. There is something incredibly indulgent about having the bounty of the local waters laid out before you like this - fresh, pure, and essentially unadorned. 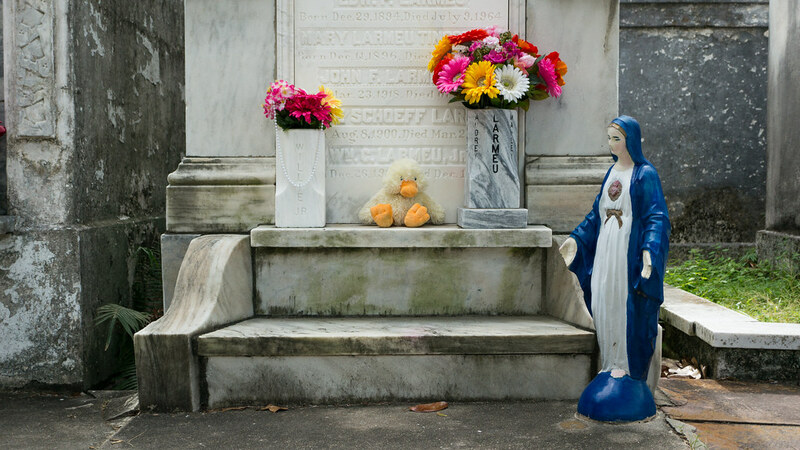 I suspect everyone who visits New Orleans more than a couple times develops certain rituals. One of mine is that I like to ingest some oysters as soon as possible. After dropping my bag at the hotel, I headed straight for Iberville Street in the French Quarter. There's always a line at Acme Oyster House; there's almost never one at Felix's Restaurant & Oyster Bar, directly across the street. I'd be willing to bet at least the price of a dozen oysters that they both get their supply from the same exact place. 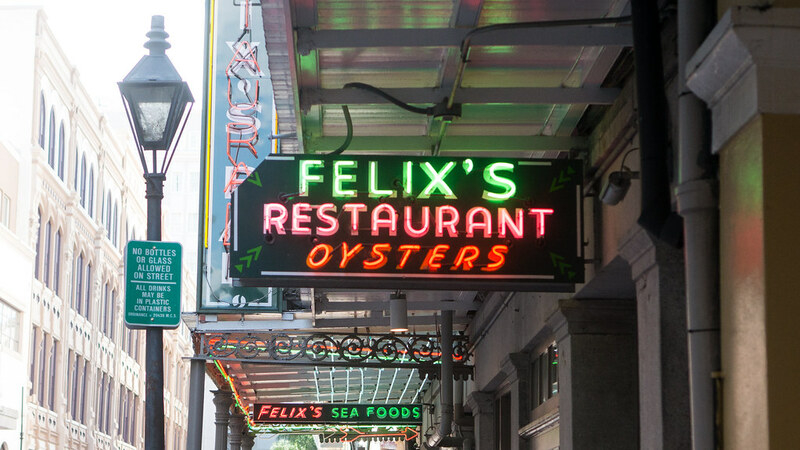 At Felix's they're available on the half-shell, "char-grilled," or in Rockefeller or Bienville modes; I sampled a half-dozen each of the first two varieties. (You can see all my pictures from Felix's in this New Orleans flickr set). Their Gulf oysters on the half-shell are plump, cold, mild, and more sweet than briny - maybe not the most characterful of oysters I've had, but far from the most offensive too. 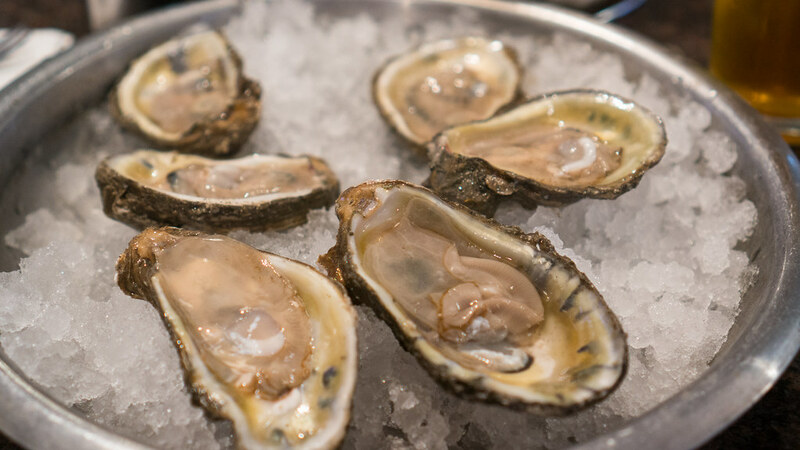 They go down easy, other than the fact that their bottoms are still caked with mud, making it tricky to sip their liquor from the shell without getting a mouthful of grit. 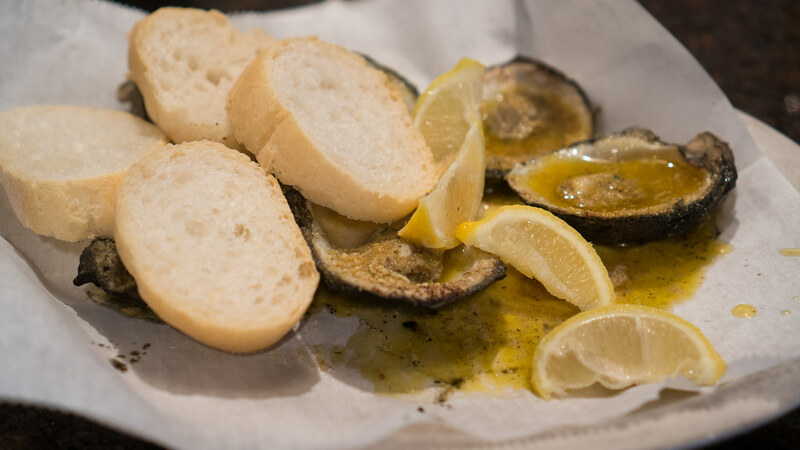 "Char-grilled," meanwhile, means shucked, warmed on the grill and slathered with garlic butter and a sprinkle of parmesan cheese. Like New Orleans style BBQ shrimp, it's all mostly an excuse for dunking bread into that rich, buttery sauce - but I'll happily engage in that charade. Speaking of rituals, I was slow to pick up on the DIY cocktail sauce program at Felix's. Every spot at the counter and every table is adorned with a still life composition of hot sauce bottles (both Tabasco and Crystal), Worcestershire sauce, and a tin of grated horseradish. An industrial size container of ketchup and little paper cups are positioned at the center of the bar, the idea being that you combine the ketchup and other accouterments according to your own taste to concoct your own personal magical blend (lemons are also available on request). For me, a dash of Crystal is all the oysters needed. As for the lady a few seats down, eating hers directly off the bar counter, with no ice platter, no plate, no nothing: well, everyone's got their own particular style.